During Amy's brief visit to New York City this weekend, I made it a point to take her to Pegu Club in SoHo for some late Sunday evening cocktails. Thanks to Linda for the fitting recommendation! 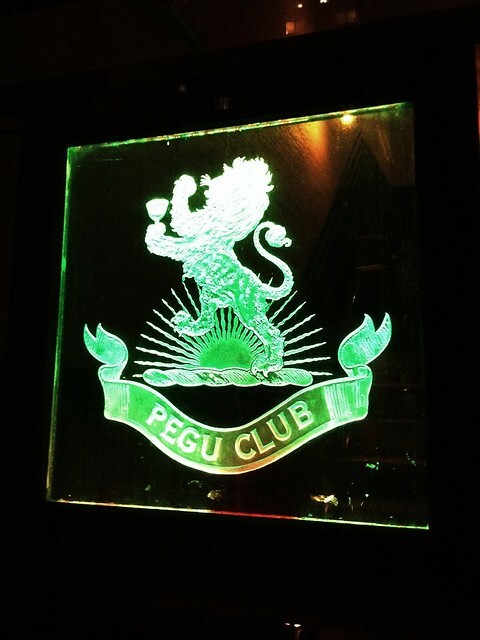 Pegu Club, whose name "pays tribute to a storied, late-19th century British officers club in Burma," was founded by mixologist Audrey Saunders. Ms. Saunders and the team at Pegu Club have an interesting "ethos" behind its mission: they like to think themselves as "gatekeepers of classic cocktail culture" relishing in "the fine art of making drinks." For example, each day, the team squeezes fresh lemon/lime/orange/grapefruit juices by hand as well as craft their own infusions/tinctures/flavored syrups/ginger beer. Big ice cubes as well as fresh soda from small bottles (instead of soda guns) are also key at Pegu Club. These "small nuances contribute an enormous amount of extra depth to its potable potions." 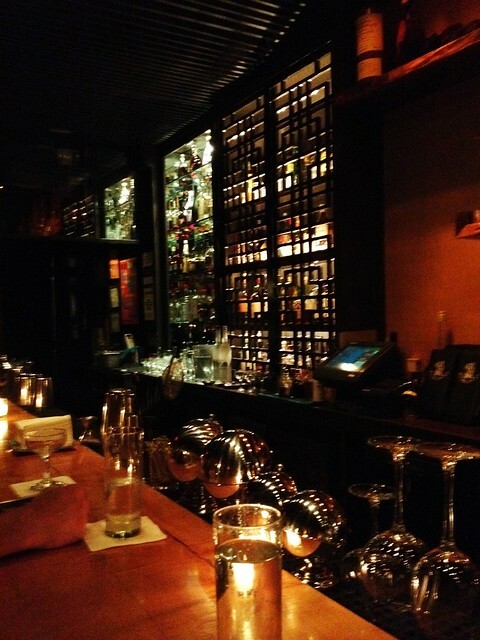 Love the modern-chinoisserie interiors of the bar/lounge. Another part of its ethos is that the team likes "to think in terms of each cocktail having its own unique personality" which therefore results in "spending many fun-filled hours perfecting new ideas and flavor combinations." The cocktail menu at Pegu Club maintains "an extensive repertoire of relished, old classics," but for the most part, it "primarily focuses on new creations to keep things interesting," mainly because "the creative process is not something they rush nor one they take lightly." The development of each drink "takes place slowly and thoughtfully and each in its own time." The menu remains undisclosed on its website for encouraging potential patrons to see what it's all about for themselves. 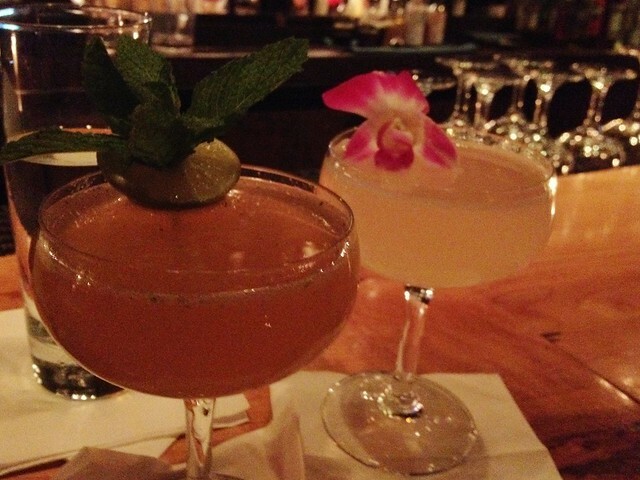 With all of this in mind, it is clear that Pegu Club is committed to producing top-notch cocktails with high-quality ingredients and well-honed techniques. It was even more evident after having made our visit there the other night. Our first round of cocktails were from the Pegu Club Classics 2012 section of the menu. On the left was the Pisco Punch for me, and next to it was the French Pearl for Amy. 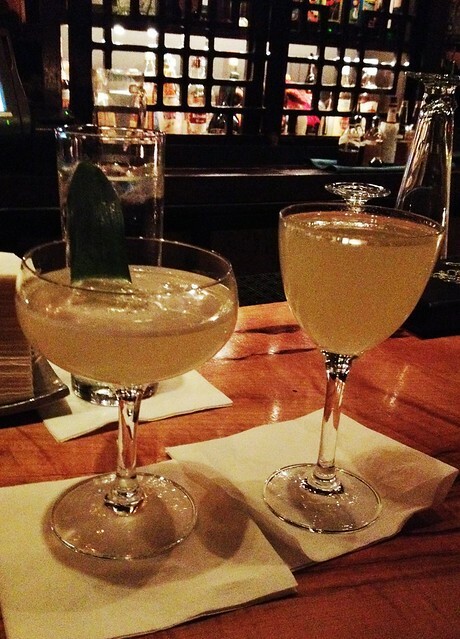 The Pisco Punch was a pineapple-infused pisco brandy, grapefruit and lime syrups, as well as fresh lemon juice. Its description heeds its drinkers that it "goes down easy" and that "they don't call it 'punch' for nothing." It was definitely "punchy" -- that is, well-mixed and tropically fruity. The citrus meshed well with the pineapple juice. Great starter cocktail! The French Pearl had gin, Pernod, muddled mint, lime juice, and simple syrup. Very mojito-like, the mint and lime proved to be very refreshing together in this well-balanced concoction. It was the perfect cocktail for Amy given how much she loves moijitos. The next round of cocktails were both from the Champagne Opportunities section of the menu -- on the left was The Old Cuban and next to it was La Fleur de Paradis. The Old Cuban is Pegu Club's "champagne mojito" with aged rum, mint, lime, Angostura bitters, and champagne. No surprise that this was Amy's other selection -- some serious mojito madness going on here! This cocktail, while similar to the other with the mint (slightly subtler here) and lime, had a little darker appearance and taste to it because of the aged rum as well as had a little more spark and excitement, which can be attributed to the sparkling aspect of the champagne. This made for a wonderful summer evening cocktail. Cannot go wrong with this choice if mojitos are you go-to. La Fleur de Paradis was a mix of gin, elderflower liqueur, lemon and grapefruit juices, orange bitters, and champagne. I was curious about this because of the elderflower liqueur (i.e., I recall having had a similar cocktail at a different place and liking it), so I figured I'd give it a shot. It was a lot more sour/citrusy than I had initially anticipated, but it proved to be a good sipping drink for the rest of the evening -- the elderflower had a nice floral overlay. Findings: What I really like about Pegu Club is its astringent commitment to quality -- not just in the people manning its prized bar, but in the ingredients used (all, if not most, made fresh in-house, including bottled sodas) and the techniques employed. Cocktails are anything but an afterthought and so are the patrons that will be sipping/tasting/drinking them. 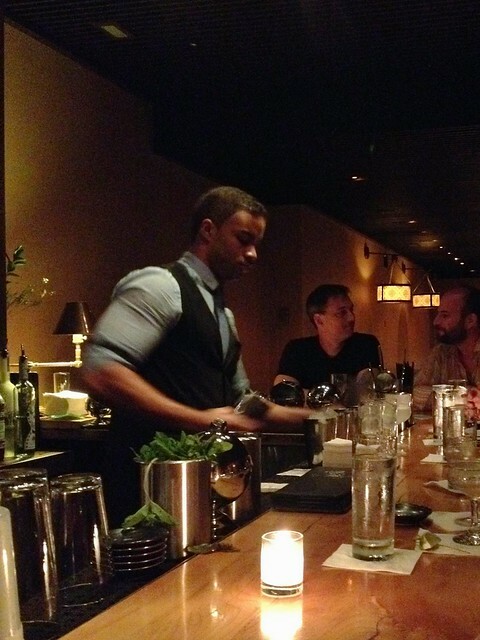 A good cocktail bar is as good as the rave reviews that its barstool occupants provide. Having tasted about four cocktails from the menu, I can undoubtedly gather that the menu has some really interesting things going on, especially with flavor combinations and seasonality mixed in with the innovative and the avant-garde. I don't mind spending a little more on quality when I know I'm getting that bang for my buck. With that being said, there weren't any drinks that we had that I could say we really didn't like (they were all delicious, and each showcased its personalities as promised), which typically happens when the ratio of alcohol to mixer/juice/bitters/garnishes/spices/herbs/etc. are way too imbalanced (e.g., weakly spiked or overspiked), precluding any kind of enjoyment. So when these well-crafted cocktails are a bit hefty in price, this goes a long way in that you're guaranteed to have in your glassed possession something strikingly relishing, no matter what you order at Pegu Club. Now I know where to tell my friends, locals and out-of-towners a like, where to go if they're in search for a way-more-than-decent cocktail -- I'll send them to Pegu Club with the biggest nudge I can give. Price point: $13 for each classic cocktail, $17 for each champagne-infused cocktail. Undoubtedly one of the best cocktail bars in New York City, as Pegu Club seems to be committed to producing top-notch cocktails with high-quality ingredients and well-honed techniques.